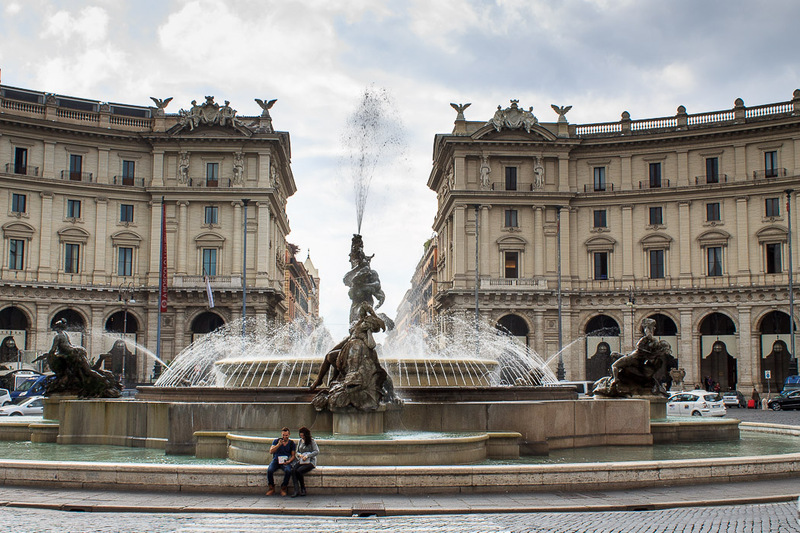 The Fountain of the Naiads is located in the center of the Piazza della Repubblica, right in front of the remains of the Baths of Diocletian, steps away from the Repubblica metro stop. The original Baths of Diocletian included the space now occupied by the fountain, so was much larger than the remains we see today. Beware, traffic can be heavy in the Piazza della Repubblica traffic circle, so be careful crossing the street to get close to the fountain. 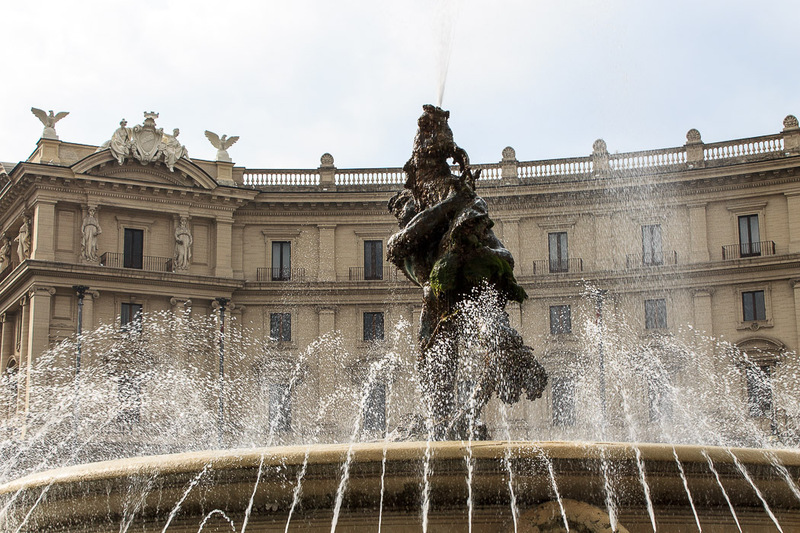 The fountain is a large round basin with a circle of sprays shooting upward and slightly inward from the outside of the fountain to form a symmetric donut shape of water. In the center is a group of sculptures called the group of the Glauco, sculpted by Rutelli in 1912, depicting the fisherman Glauco fighting a fish, symbolizing the dominion of mankind over natural forces. A tall central spray is shot upward from this sculpture. But the real highlight of this fountain are the four Naiads (nymphs) evenly spaced at the edge of the fountain, each with a jet of water spraying from the center toward them. 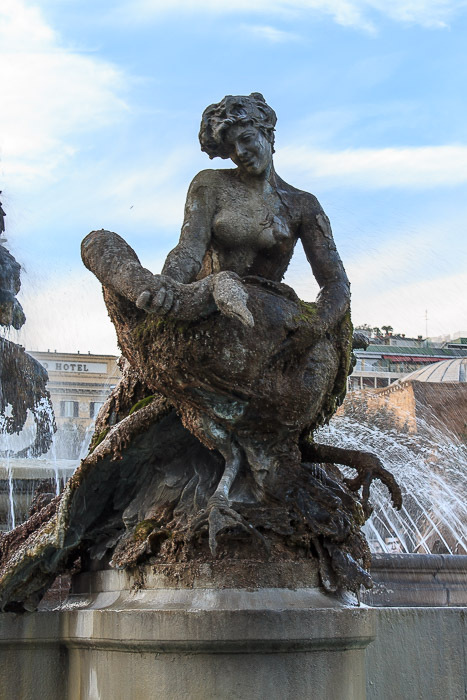 See all Fountain of the Naiads photos. 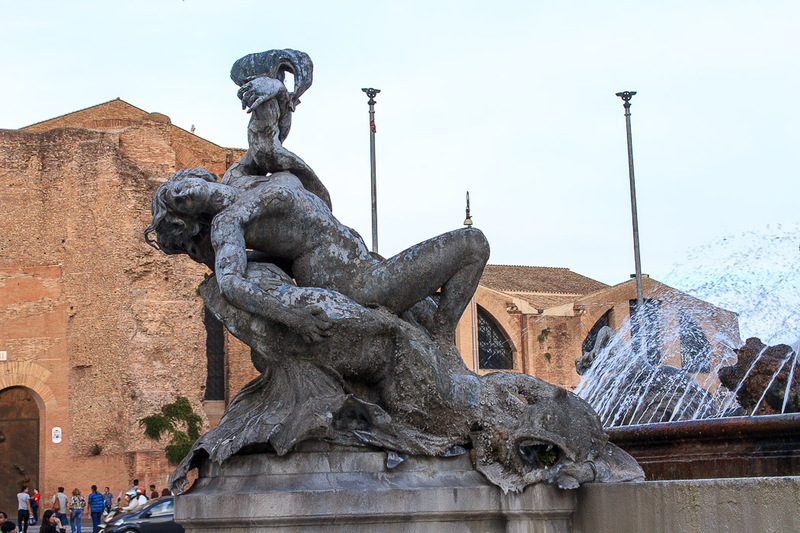 The fountain was originally built in the 1870s after a new aqueduct named the Acqua Pia-Marcia was built; the aqueduct's main output was about 80 meters from the present fountain. The fountain as originally built didn't have statues decorating it, so the people thought it was lacking something. 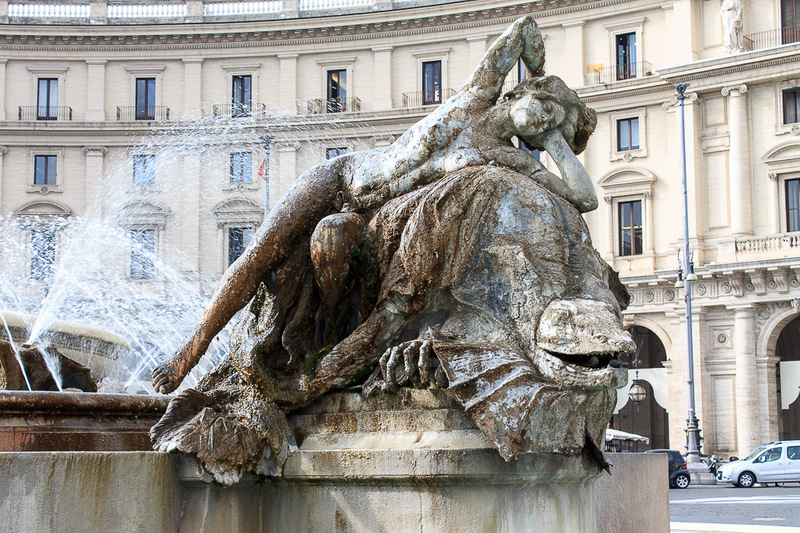 Lions were made of plaster and placed at the four corners of the fountain to improve its look but the people of Rome complained against this fake solution and the city council commissioned a Sicilian artist, Mario Rutelli, to make real statues. The figures were to represent the four water nymphs: The Naiad of the Oceans, the Naiad of the Rivers, the Naiad of the Lakes, and the Naiad of the Underground Waters, each with an allegorical animal that represented their environment. But nobody imaged quite what the artist had concieved, and the population was shocked when the statues were finally unveiled in 1901: four completely naked young female figures whose bodies, soaked by water that gushed from a large nozzle at the back, glittered in the sun in a very lascivious manner. 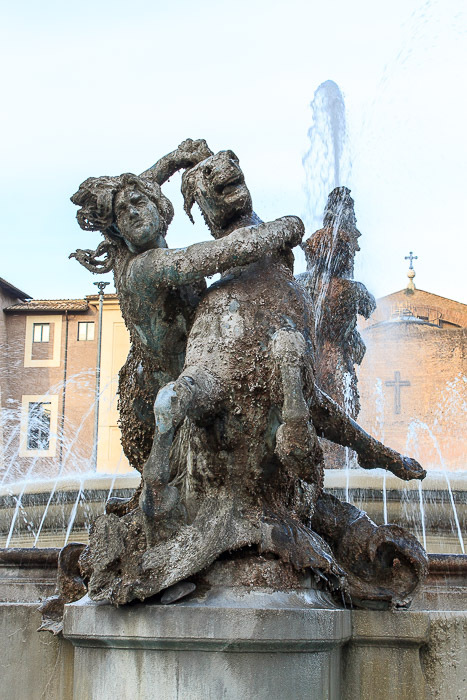 The young men of Rome liked the statues a lot (as do I), but the conservative factions in the city battled to have them taken away in the name of morality and decency. It didn't work; the statues have remained (thank goodness!). Meanwhile, the central statue had not yet been made. Rutelli, probably disappointed by the lack of universal admiration for his work, sculpted a bizzarre group that featured three human figures, a dolphin and an octopus tangled together in a wrestle, and unveiled a model of it in mortar in 1911 before he sculpted the final version in bronze. The reception was poor, though, with the people nicknaming it "the fish fry of Termini". Rutelli went on to sculpt the more conventional group that stands today: a single male figure embracing a dolphin. The "fish fry" can be found today in Piazza Vittorio Emanuele (not near the Victor Emmanuel Monument) as the Rutelli's Fish Fry. Meanwhile, the four naiads can be seen here: The Naiad of the Oceans rides on a horse (1st photo below), the Naiad of the Rivers is lying on a river monster (4th photo below), the Naiad of the Lakes is holding a swan (3rd photo below), and the Naiad of the Underground Waters is seated on a mysterious dragon (2nd photo below).